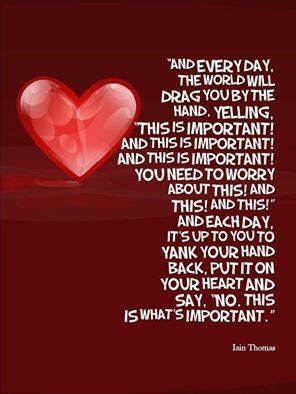 Do you take care of your heart? Not physically, but emotionally? Do you cherish and respect you? Or is your focus on everyone else around you, and your ‘tasks to be completed today’ list? As a midwife, I would advise new mothers to ensure they cared for themselves. A mother who is sleep deprived, not eating well and unrested, will never have the stamina and patience to be the best mother she can be.. This advice applies to each and every one of us. We too, cannot be the best version of ourselves if we dedicate our days to all but ‘me’. Respect you, say no to demands when you really need to be looking after self. Sit or lay quietly for just 5 minutes. Place your hands on your heart and breathe in to your heart space, sending love as you do so. Imagine purple light flowing into and around the space as you breathe, see it expand through your body, filling every corner. See it expand out through your chest and surrounding you. How beautiful is that image? How wonderful does it feel?